Seems like every symptom possible can be caused by cancer, but some symptoms of cancer also have very benign causes. This includes headache, cough, sore throat, stomach discomfort and even itching. But we can’t go through life panicking over cancer every time we get a headache or itchy area of skin. Nevertheless, it’s important to have guidelines over which symptoms of cancer can mimic harmless situations. One example is unintentional or unexplained weight GAIN. This is often attributed to aging or diet. The weight gain from cancer (such as ovarian) would be fluid retention in the abdominal cavity, masquerading as a harmless expansion of the belly due to fat gain (though excess belly fat isn’t harmless, but compared to cancer, it certainly is). 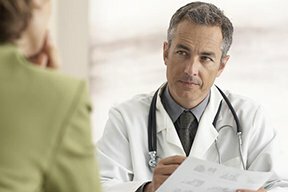 “Often cancer symptoms are nonspecific, and the amount of tumor burden has to be significant for symptoms to actually manifest unless cancer happens to sit near the critical structure organ, or near a nerve which may prompt early symptoms,” says Mark Levandovsky, MD, Founder and Medical Director of Preventive Medicine and Cancer Care. He is a board certified internist and oncologist/hematologist in practice for over 17 years. “In general, one needs to have about one billion [cancer] cells for symptoms to manifest,” says Dr. Levandovsky. Slowly progressive fatigue can mimic natural aging, especially in someone who never exercises, is overweight or smokes. Same with loss of energy. Stress is also often blamed on this. Weight loss that’s unintentional and unexplained can be quite welcome to someone who’s “struggled” for years with excess weight. These three symptoms can be caused by diabetes, and a person may even believe they might have diabetes but still delay seeing a doctor – while the tumor progresses. “The key is consistency and persistence of symptoms,” says Dr. Levandovsky. A good example is the persistence of a cough or what might be described as indigestion. Another example: The common and almost-always harmless (though inconvenient) symptom of constipation becomes worrisome when it’s persistent and not responsive to popular treatments. “Pain may also happen but is less, and, it is typically associated with cancer involving bony structures or nerve roots,” says Dr. Levandovsky. For example, a dull (and persistent) stomach ache is far more likely to be cancer than are piercing stomach pains that drop someone to the floor. But don’t avoid an ER visit for those! A non-cancerous cause of sudden agonizing stomach pain can still be life-threatening (e.g., ruptured blood vessel or cyst). A sudden brute-force headache that feels like a clap of thunder is many more times likely to be a burst blood vessel or migraine than a brain tumor. This kind of headache is not likely cancer. The brain tumor headache isn’t usually very high on the severity scale – but it’s persistent and non-responsive or marginally responsive to pain pills. This isn’t to say that cancer can’t cause severe pain. It’s just that overall, when all cancers are considered collectively, the pain from a malignancy tends to be subtle to moderate rather than harsh and severe. Sharp sudden pain in the back, which is usually of a benign nature such as sciatica, CAN be a tumor pressing on nerves. In cases such as these, an MRI quickly yields answers, but unfortunately, there are people who will neglect seeing a doctor, thinking that the pain is a benign disc issue, when in fact, it’s a tumor. “For cancers that occupy most central locations in the abdomen or chest — pain, discomfort or cough are often not picked up until cancers are more progressive,” says Dr. Levandovsky. A new mole is another seemingly harmless thing. 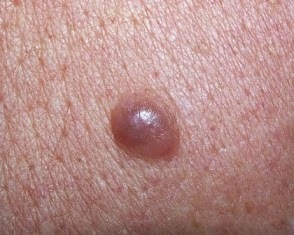 But what appears to be a new mole (especially after age 40) may actually be melanoma. What looks like a harmless pimple may be melanoma, too, or a much less dangerous skin cancer called basal cell carcinoma. With these new pimple-like growths, the key, again, is persistence – as well as progression. A harmless pimple has a life cycle of two or so weeks. If it persists, get it checked out. It may not be melanoma or BCC after all, but the persistence means it’s definitely not a pimple, either. The persistence of even dull or vague symptoms should not be ignored. The likelihood of cancer is NOT proportional to the severity of the pain or symptom. The deadliness of cancer is not proportionate to the dramatic quality of symptoms, either. An example is a type of pancreatic cancer (functioning neuroendocrine) that secretes hormones. Such a tumor of only one millimeter (very early stage) will produce dramatic and painful symptoms if it’s secreting hormones. But at one millimeter, the prognosis is excellent. Compare that to the most common form of pancreatic cancer (adenocarcinoma) which, by the time it begins causing seemingly harmless symptoms (itchiness, suppressed appetite, stomach/back pain), it usually has progressed enough for a very bleak prognosis. In short, symptoms that don’t go away despite home treatment, and especially if they’re getting worse, warrant a trip to the doctor. One eye suddenly tearing or very watery and won’t let up (sinus or lacrimal gland cancer). Common cause: debris in tear duct. Ongoing nasal stuffiness (sinus cancer). Common causes: chronic sinus infection or allergies. New-onset picky eating in a preschooler (brain tumor). Common cause: preschool age. Eye floaters (ocular lymphoma). Common cause: age. Shoulder pain (bone or lung cancer). Common causes: bursitis, rotator cuff problems. Seemingly harmless but persistent symptoms don’t always mean cancer, of course, but when they do — a delayed diagnosis can cost you your life. Dr. Levandovsky provides personalized care to health conscious individuals as well as cancer patients and survivors, focusing on an integration of genetic/molecular risk assessments, prevention, education, nutrition and psycho-oncology. Can Cancer Cause a Stomach Ache After Eating? When Are Symptoms Probably NOT Cancer?